Hay’s charismatic presence and resounding voice, as bar singer, Sally Bowles, exceeds even Liza’s Minelli’s rendition from the 1972 movie.Her portrayal of a passionate woman torn between freedom and stability is gut-wrenching. Juan Chioran is satisfyingly menacing in his part as the mysterious, gender-bending emcee. And Benedict Campbell tears the audience’s heart out as the Jewish grocer, Herr Schultz, who refuses to leave Germany just as Hitler is about to take power. This play is not just about music. But music dominates the landscape. Musical director, Paul Sportelli, as always, does a wonderful job of creating a mood and atmosphere that underscores everything on stage. The lively and evocative musical performance transports the audience to a cabaret in 1930’s Berlin in a manner no words could achieve. Director, Peter Hinton, blends the threads of the story together—skillfully going back and forth between the personal and the political and the make-believe and the real. The stream of consciousness approach encapsulates the audience in a dream-like stupor—a fantasy that doesn’t really end until the rude awakening when the stage becomes dominated by the red light of fascism. Judith Bowden’s bold, playful costumes at the beginning and the stark, bland uniforms in the second act poignantly illustrate the transformation. The horrific implications of the time and place are clearly conveyed in Michael Gianfrancesco’s stunning set design—a gigantic sculpture of black, circular staircases that rotates as the characters lean precariously over the precipice. The precipice is upon the choristers as the once happy patrons of the Kit Kat Club transform from dancing partiers into devoted fascists wearing swastikas on their arms. The audience revolts at how fast the change occurred. This play is more relevant now than ever. And this is a performance worth seeing. 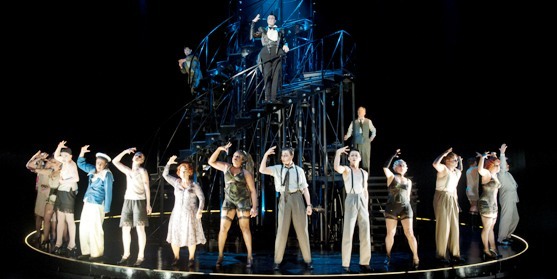 “CABARET” is playing at the Festival Theatre until October 26th. “Mac is the new Orange”; an A+ CAE! Pretty! This was an incredibly wonderful post. Thank you ffor supplying tis information. plan outfits, accessories, and shoes that you can wear and coordinate into several different ensembles. The best advice we can give is JUST start doing it. Pick your subject (preferably something familiar), write your opinions (remember the 5 “W”‘s) and then spell-check & read it aloud before uploading. & sends a message through music � <Liked it!